Open Window Theatre is not easy to find, even though it’s close to downtown and right off the freeway. But it’s a darn sweet space and worth haggling with Google’s voice-activated GPS to find it. (The Google voice had it right, by the way, but didn’t understand that the parking area and entrance are at the end of the building, not the part facing the street. But now you know, and you can have the pleasure of experiencing it’s eclectically and wonderfully cluttered lobby, and cozy thrust-stage seating. 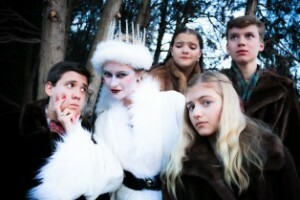 The play, this holiday season is the “The Lion, the Witch, and the Wardrobe,” by C.S. Lewis, a writer familiar to the theater and the director, Joy Donley. “I’m the resident C.S. Lewis director,” she says, having directed “Shadowlands” at Open Window, as well as other Lewis works. Questions of religion and spirituality are of interest to this theater. According to artistic director, Jeremy Stanbary, “We don’t shy away from bringing issues of faith and spirituality to the company.” Stanbary says. In fact, that the theater focuses on stories with “a strong redemptive quality,” exploring dark conditions in the world, but that offer hope for positive change. Lest you imagine an overly ponderous or stark rendition of this fanciful play, you may be assured that an evocative set and imaginatively costumed characters are part of the artistic team’s vision for this production. Costumer Rick Rees, who teaches technical theater at Bethel University in St. Paul, says his goal was to find something unique and distinct for this production. “A lot of people have seen the movie,” he points out. “I didn’t want to use a lot of fur [since there are animal characters],” so we looked at how the costumes could reflect what they do and who they are. “Mr. Beaver,” for example, appears as a fisherman, since he fishes and builds dams. “But the unicorn has a horn,” he says, since – well, “it’s a unicorn!” Casting also took some creative turns with a woman centaur, for example. The show opens December 4 and runs through December 30. Visit the theater’s website, openwindowtheatre.org, for ticket information.